Remember the Kia Borrego, the homely, body-on-frame, three-row SUV that launched for 2009 and into a recession, soaring fuel prices, and a market shift to car-based crossovers? The Telluride is the biggest SUV to come from the Hyundai/Kia quiver. It’s bigger than the Borrego and bigger than anything else currently sold by the Korean manufacturer. Kia acknowledges that it already produces a three-row crossover in the Sorento but considers that SUV’s cramped rear seat to be part-time use only. The Telluride strays from the Sorento’s minivan proportions. At first glance, the two-box shape echoes that of a Range Rover. The front fascia is elegantly sculpted, and Kia’s Tiger Shark grille design-its largest-rests between headlights that feature orange halo rings. In the back, the design elements remain subtle, with hockey-stick taillights flanking the outer edges. LED lighting is available at both ends. The Telluride’s exterior design is clean, simple, and from some angles, rugged. But it’s inside where the Telluride shines, thanks to the use of soft-touch materials, attractive plastics, and attentive ergonomics. All trim levels boast leather or synthetic leather upholstery and a leather-wrapped steering wheel. The available faux-wood inserts and simulated brushed metal that split the dash are tastefully executed and help the Telluride to teeter on the edge of luxury. The Prestige package ($2000) available on the SX trim is a no-brainer, adding nappa leather, heated and ventilated captain’s chairs for the second row, faux-suede wrapped pillars, a head-up display, rain-sensing wipers, and an AC power outlet. Naturally, the Kia features a wealth of safety equipment. On the top-tier SX trim, a 7.0-inch screen in the instrument cluster displays images from the side-view cameras to monitor blind spots when the turn signals are activated. Blind-spot monitoring, forward-collision warning and avoidance, lane-keeping assist, and adaptive cruise control are all standard equipment. The adaptive cruise, however, is reluctant to ease into the wake of traffic ahead, instead slamming into a radar wall with a large braking event. Also available is Kia’s computerized Highway Driving Assist system, the company’s most advanced driver-assist tech to date. It’s effective, too, avoiding the lane wandering that’s common in similar active-safety systems. The base-level front-wheel-drive Telluride LX starts at $32,735, including an abundance of standard equipment. An all-wheel-drive Telluride SX costs $44,535. Factor in another $2000 for the Prestige package, and the top-tier ute’s luxuriant list of features and amenities make it among the most well-endowed three-row SUVs available for less than $50,000. 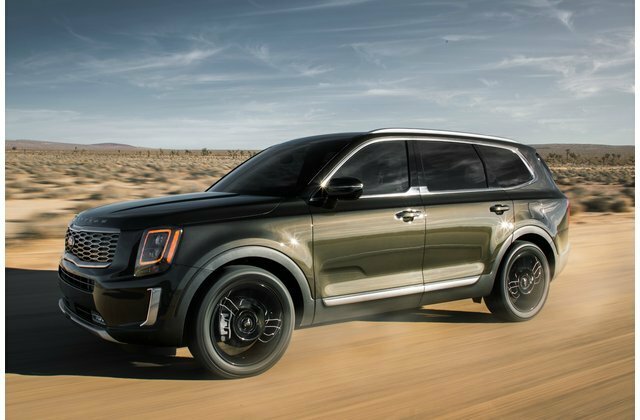 While that value proposition might exceed what we’re used to seeing from Kia, the Telluride is not only a far better vehicle than the Borrego, but a highly compelling three-row SUV in its own right.